World media discuss the decision of the Italian president to block the formation of the government, proposed by the coalition of Eurosceptics from the parties "League" and "5 stars". Now there is quite a specific situation when the president of the country was elected by the previous pro-European parliament, and the current parliament, in the majority, is very Eurosceptic. And it turns out that the president from the old parliament on the one hand and the winning parties in the new parliament, on the other, is not able to form a government. As explained later by President Matarella, the whole fault is the figure of Paolo Savona, a well-known Italian economist, whom young parties have proclaimed for the post of Minister of Finance. 81-year-old Savona - a convinced critic of the euro and the author of the plan for the withdrawal of Italy from the eurozone. The president did not hide that the reason for the refusal was Savona's position on the most important economic issue. The appointment of Savona can indeed cause panic in the capital markets, which are already worried by the fact that the third economy of the eurozone will be managed by populists. "5 stars" and "League" advocate the growth of public spending and tax cuts aimed at revitalizing the sluggish Italian economy. the world is moving towards yet another major financial crisis. Europe is in existential danger, it's not a figure of speech, it's a cruel reality. 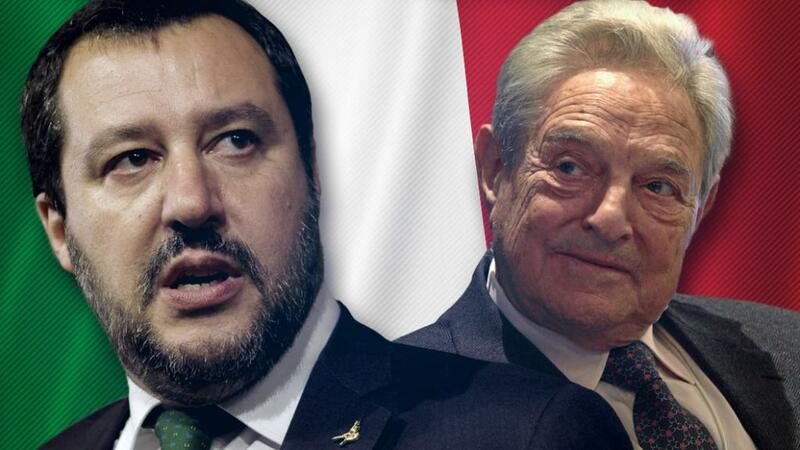 As "Europe" Soros implies, of course, the globalist project of the European Union, whose main task is the erosion of the identity of the peoples of the Old World. In addition, they are also dissatisfied with the position of the Italian Eurosceptics in Berlin. In the event of Italy's withdrawal from the euro area, the consequences will have to be raked by the government of Angela Merkel, who also with all her might keeps Rome from withdrawing from the European integration project. Inside the country itself Eurosceptics are opposed by the proteges of the global elites who are defending the EU. It was these power circles that pressed President Matarella to block the formation of the government. Formally, Matarella appointed a "government of technocrats" headed by Carlo Cattorelli. It is not surprising that this man is a former employee of the International Monetary Fund, in fact under the control of the influential financial dynasty of the Rothschilds. He must quickly form a government of people without political ambitions, who will fulfill their duties until a new election. To do this, you need to get the approval of the parliament, which probably will not happen, since most places are just Eurosceptics. In this case, the country is expecting new elections. Eurosceptics are sure that if the elections are held in the near future, they will improve their results, as the discontent with the policy of the current executive power is only increasing. "Old elites", controlled by Brussels, on the contrary, will try to postpone the elections as much as possible in the hope that the "populist moment" will come to naught. The only thing we can be sure of is that there is a majority in the parliament that can propose and pass laws, and the first thing we will do is start a discussion about a new law on elections. Why do elites do not like Eurosceptics? In addition to the desire to ensure the sovereignty of their own country, to protect themselves from illegal migration and withdraw from the euro area, new parties are actively declaring that they are in favor of rapprochement with Moscow and the abolition of anti-Russian sanctions. The leader of the "League" Matteo Salvini has repeatedly visited Moscow, where he met with Vladimir Putin, State Duma deputies and journalists. Salvini was one of the first to congratulate Vladimir Putin on winning the March 2018 election, wishing him "good work".